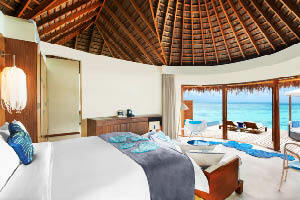 Enjoy iconic blue waters, stunning reefs, and bright white sandy beaches while staying at the W Resort & Spa. 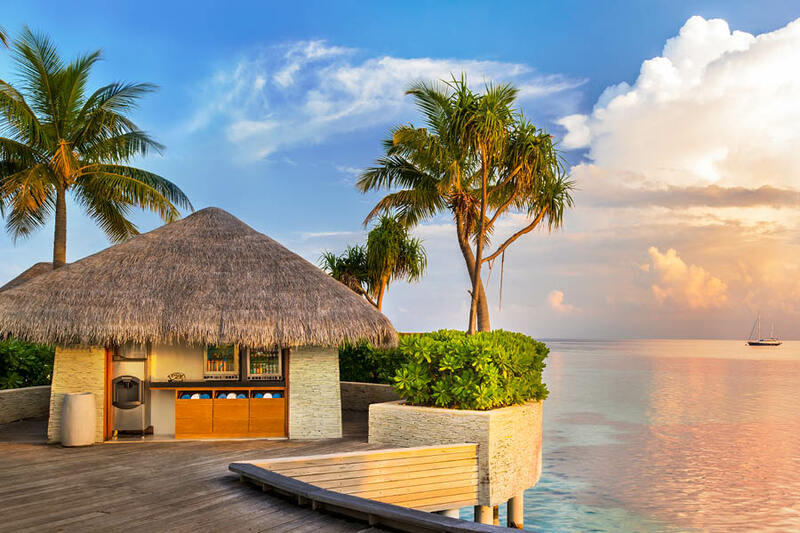 This Maldivian resort is everything you would expect from a traditional W resort, but with a slightly toned-down party scene to match the relaxed island vibes. 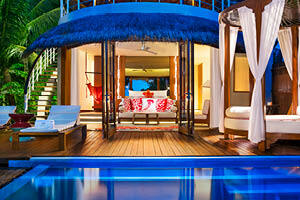 The W Maldives is an exclusive adults only resort (no children under 10 years) and can only be reached by seaplane. 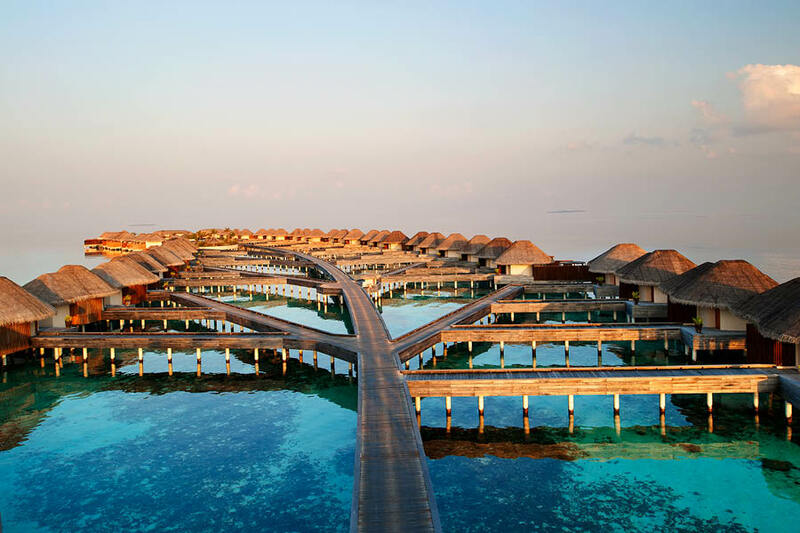 The W Maldives is situated on its own private island. 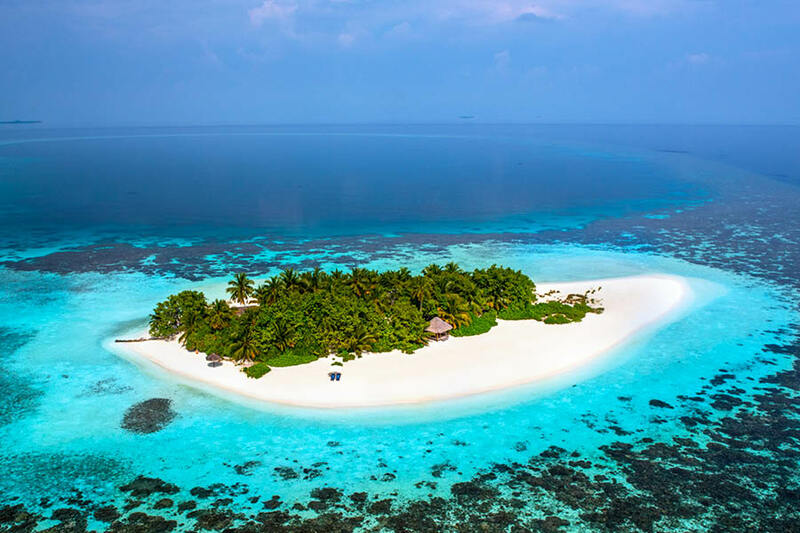 A scenic 25 minute seaplane ride from Malé International Airport. 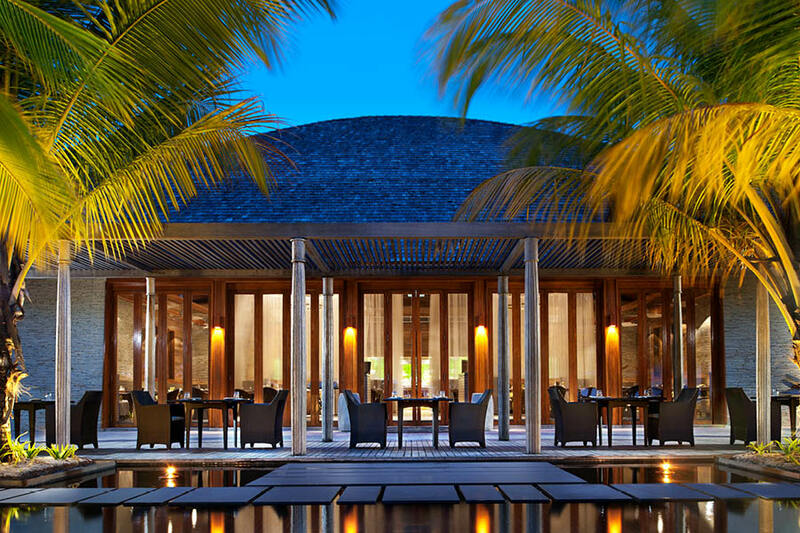 This 5-star resort provides luxury accommodation, unbeatable service, and uninterrupted views of the Indian Ocean. 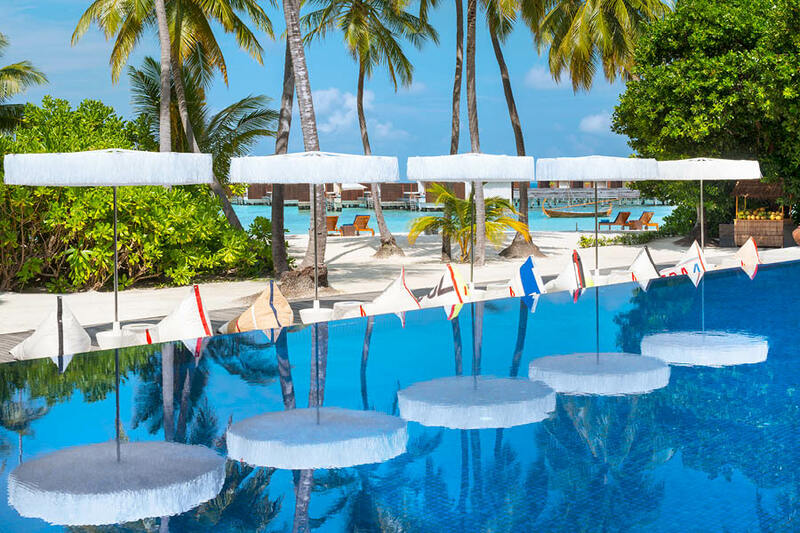 Consisting of 77 spacious villas, each with direct beach, reef, or ocean access, the W Maldives blends innovative architecture and contemporary living with island village simplicity. Guest facilities include an outdoor infinity pool overlooking the Indian Ocean, a fitness centre, and the award-winning AWAY SPA. There are multiple dining options, including an international menu at KITCHEN, and barbecued delights at FIRE. Cocktails and assorted beverages are featured at SIP, and the W’s signature restaurant, FISH, serves delicious fresh seafood daily! With world-class snorkelling and diving at the island’s doorstep, why not explore dive sites such as Maaya Thila, Fish Head, and Fesdu house wreck? Alternatively there are plenty of water sports to keep everyone entertained. Wave Activities have a dynamic range of water adventure and sporting equipment with thrills and spills guaranteed! Choose from windsurfing, juet skiing, kite surfing, parasailing, and more! 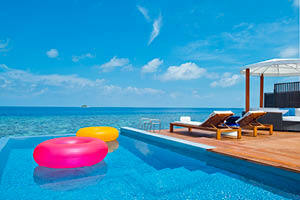 The W Maldives is the ideal destination for a luxurious and fun-filled holiday. PLEASE NOTE: From 1 November 2017 to mid-December 2017, the Away Spa will be closed for a complete makeover. During Renovation, all spa treatments will be held at different locations. 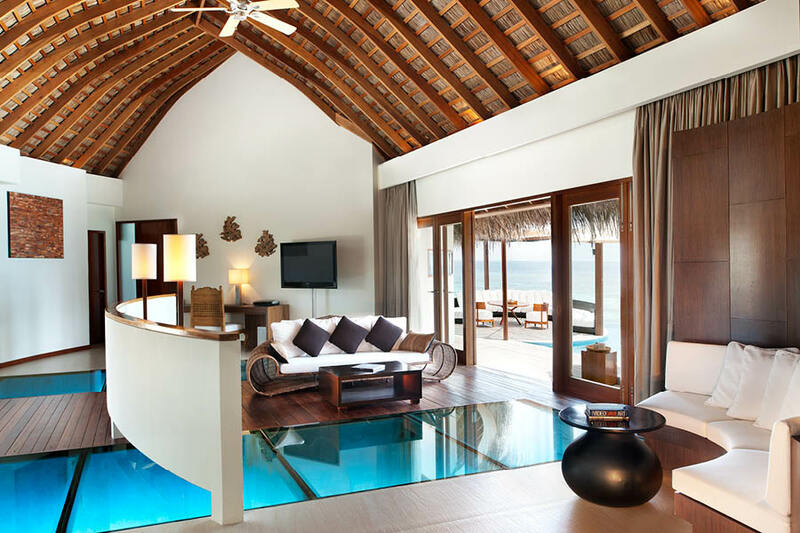 Enjoy the simplicity of this bi-level beach villa in Maldives. A spacious outdoor lower deck (118 square metres) covers all the amenities of absolute tropical luxury, starting with a plunge pool and a circular daybed, nestled within absolute privacy and pristine white sands are just a moment away from your doorstep. Stay indoors forever with the 42” plasma TV, BOSE sound system, complimentary High Speed Internet Access, king-sized signature W bed, wine fridge and delightful Munchie Box. Bathe under blue skies or bright stars in the open roof bath area with standalone bathtub, rainforest shower and Bliss Spa bath amenities. Upstairs, a swing daybed, fridge and BBQ area beckon in hideaway living space, complete with unobstructed sweeping views of the coast and soothing sea breezes. 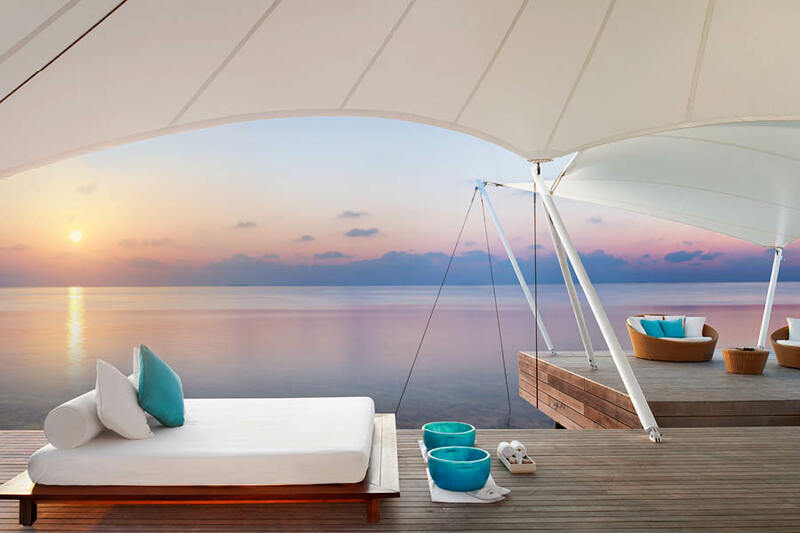 With direct access to the ocean from your deck you can lounge, gaze, swim or snorkel all day whilst staying in this over-water one bedroom Lagoon Villa alternatively enjoy the privacy of the sundeck, kick back in the plunge pool or recline on the circular daybed. Stay close to the marine life with glass panels in the floor indoors reveal beautiful ever-changing aqua scenes. A whole new world reveals itself after dark when you flip a switch to illuminate the underwater nightlife. Mix it up with the 42” plasma TV, BOSE sound system and complimentary High Speed Internet Access, Bliss Spa bath amenities are located in your bathroom and the king-sized signature W bed will have you feeling refreshed. 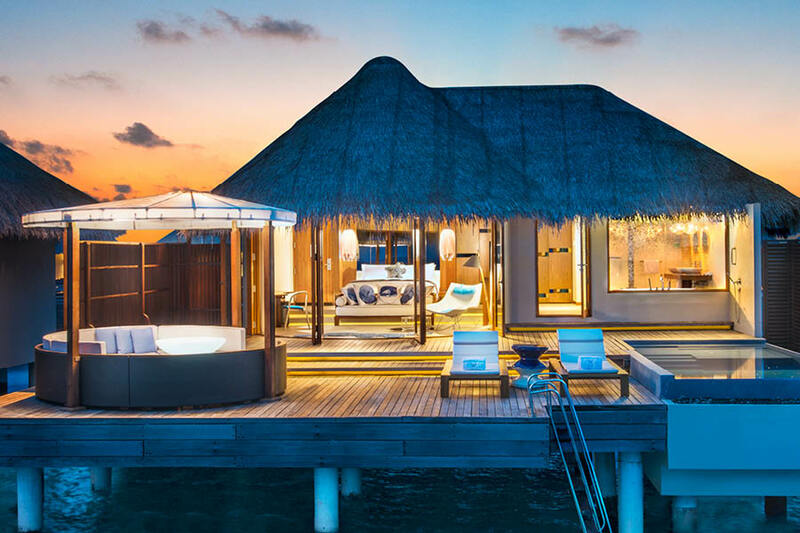 Spy on the island’s marine life in this over-water one-bedroom Maldives ocean villa located above a transparent lagoon or enjoy it all from the privacy of your own plunge pool and deck. Inside stay connected with the 42” plasma TV, BOSE sound system and complimentary High Speed Internet Access with Bliss Spa bath amenities located in the bathroom, don’t forget the king-sized signature W Bed located within this beautiful room. 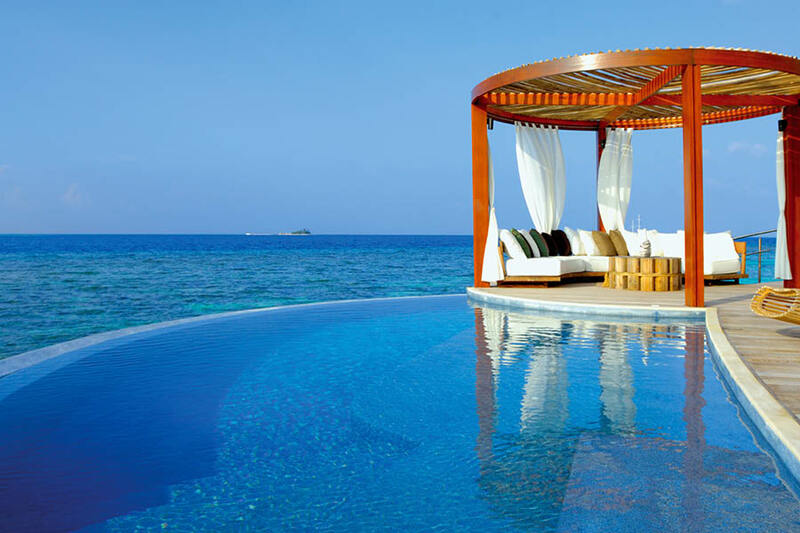 The W Maldives is situated on its own private island. 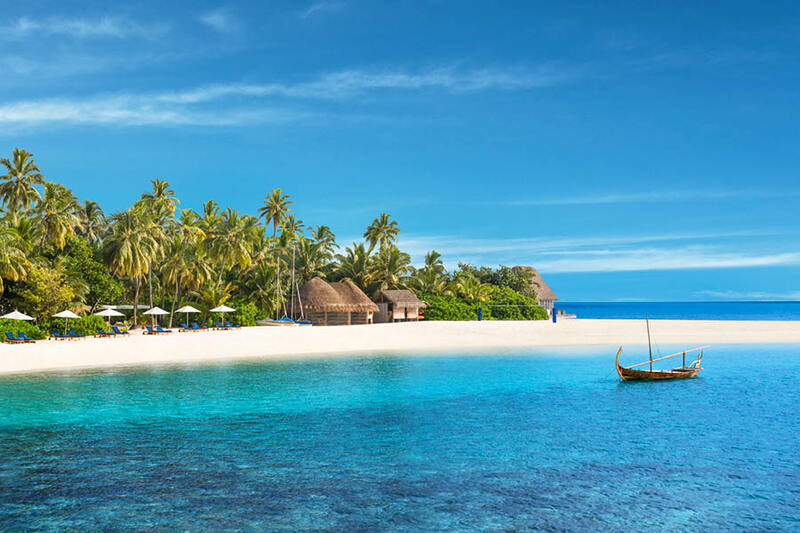 A 25 minute seaplane ride from Malé International Airport will take you there. 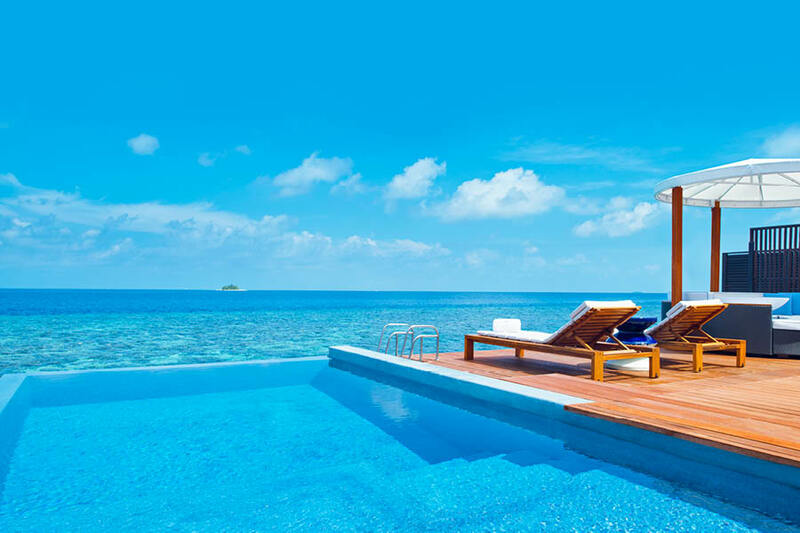 The W Maldives has so much to offer, you’ll want to extend your holiday to fit it all in! Snorkel, dive, or take part in a range of water sports and, when you’ve soaked up enough sun for one day, try out some of the onsite activities. Keep active with aqua aerobics and FIT training, play pool, billiards, and table soccer, or watch your favourite films at the WORDS centre. Escape on a glamorous yacht excursion to other islands, fish the day away, and spend your nights captivated by the illuminated Sea of Stars—a natural chemical reaction that you’ll never forget! Amazing doesn’t do this resort justice. It is by far the most spectacular place we have ever visited (and we have been to some pretty good hotels). From the moment you land in Malé, everything is taken care of. The staff are exceptional…nothing is too much trouble. It’s paradise – perfect – 10/10!